FRIED MASHED POTATO BALLS loaded with bacon, cheese, and onions are perfect for Thanksgiving leftovers! 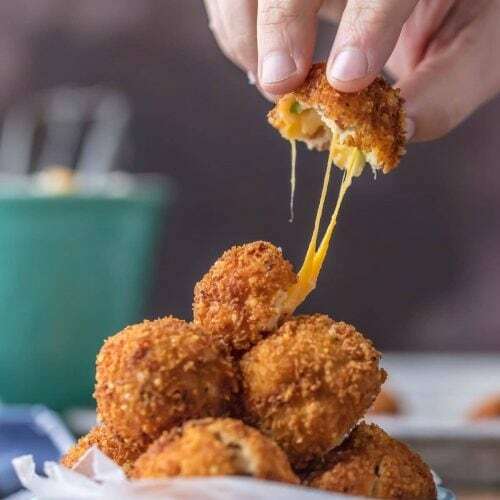 Put those leftover potatoes to good use and fry up some cheesy mashed potato bites. These loaded mashed potato balls make the ultimate appetizer or side dish! In a large bowl, combine the potatoes, shredded cheddar, onions, and bacon. Use an ice cream scoop to form 1 inch balls, rolling with your hands to create the shape. Push 1 colby jack cube into the center of each ball, and then re roll the mashed potato mixture around it to make it round again. Place on a plate and repeat with the rest of the mashed potatoes. Set in the fridge for 30 minutes to set. In a shallow bowl, place the egg. In another shallow bowl, mix together the bread crumbs, parmesan, and salt and pepper. Start by dipping each ball into the egg mixture, shaking off the excess, and then rolling in the panko mixture. Pat to make sure the panko adheres well and that the mashed potatoes are fully covered. Set back on the plate and set aside. Heat a large pot or dutch oven with about 2-3 inches of oil to 375F. Carefully drop in the mashed potato balls 3-4 at a time into the hot oil, allowing them to be fully submerged. Use a slotted spoon to lightly stir as they fry to make sure they don't stick to the bottom or sides of the pot. Fry each for 2-3 minutes or until they are fully browned and crispy. Use the slotted spoon to remove from the oil and place on a paper towel lined plate to drain. Repeat with the remaining mashed potato balls until they are all fried.